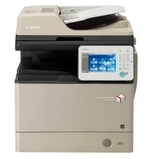 Canon have announced the launch of the latest A4 color MFPs, the imageRUNNER ADVANCE C250i, C350i and C351iF. These three models fill what was hitherto a gap in the imageRUNNER ADVANCE range, that of A4 color. First launched in 2009 in the A3 color segment, the "iR ADVANCE" concept was then extended right through the A3 range through monochrome A3 and then A4. To date Canon have sold over 400,000 iR ADVANCE units just in the EMEA. The print speed for the imageRUNNER ADVANCE C250i is 25 ppm, compared to 35 ppm for the C350i and C351iF. Their paper capacity can be up to 2300 sheets. These multifunctions have the same interface as other imageRUNNER ADVANCE machines, a customizable 7-inch color touch screen, the same size as that of the monochrome A4 iR ADVANCE machines. These machines all run the MEAP and MEAP Web software platforms, so are compatible with a wide range of document capture and management apps, as well print accounting and scheduling apps. Canon are also highlighting the security aspects of these devices. User authentication is provided as standard, and they all support the Data Loss Prevention system designed to restrict the leaking of confidential data. Printing costs can be analysed and limited using Canon's Universal Login Manager (no server required). Worth noting also that these machines can update their own firmware and provide error management without the need for a fleet management app. As regards the environmental aspects of these machines, Canon have announced a very low TEC value, one of the lowest on the market, testament to the very low stand-by electrical consumption (under 1W). They will be available in June 2014.